The Sci Fi Lab discusses all the best in science fiction, from movies and television to literature and actual science. Greetings loyal listeners! Due to a series of unfortunate events and bugs, this webpage has become sorely out of date. Luckily the great and mighty engineers here at WREK have fix the problem and provided a solution to the issues. All this to say: This page shall live again! That’s right. You can now return to following this page for updates and notes for each episode of the ScifiLab. Or at least you can until I leave, the new guy might not be so verbose as I am. Anyway onto the show notes! Matthew – formulating a Rodger Rabbit and Space Jam ultimate theory. Tron as a liminal story about the division of Sports and Games. I.E. People v People and People v Pieces. Also discussed the “Black History Month Symposium” at Clark Atlanta University. Being hosted Monday, Feb 22, 2016, from 10am – 4pm. Perry part of Nanowrimo – Lord Parsiful – Protagonist, Psychic, in a world invaded by aliens. Teach humans physic powers so he can hunt humans for sport . This week we discussed music in science fiction and listened to THE GLASS FORTRESS (BASED ON ZAMIATINE’S “WE”) by Rémi Orts Project & Alan B. Next week: We talk about Tabletop Games and Game Design, with a pre-recorded interview with Ross Payton of Role Playing Public Radio fame. 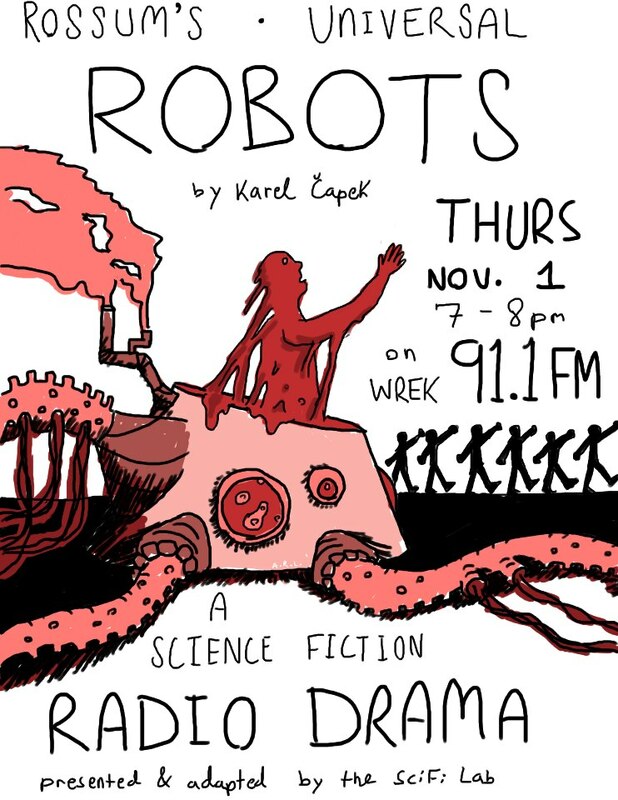 This Thursday, Nov 1st from 7-8 pm, the Sci Fi Lab will present an original adaptation of Karel Čapek’s “RUR: Rossum’s Universal Robots.” Written in 1920 and produced a year later, “RUR” introduced the word ‘robot’ to the English language. Since then, it has inspired everything from the replicants in “Blade Runner” to the Bot planet in “Futurama.” We hope you’ll tune in and experience a piece of science fiction history!